For over a year, Sandy Singer went from one doctor to another, hearing from each of them that he had chronic anemia. Yet their treatments didn’t help, so the 67-year-old technical heavy maintenance representative for Jet Blue decided to fly from his home in Las Vegas, Nev. to New York for a thorough evaluation. There, in June 2015, he learned that he was suffering from myelodysplastic syndrome, a disorder of the bone marrow, and he would need a marrow transplant to survive. “I worried about missing work – I love my job,” said Sandy. “When none of my family turned out to be matching donors, I felt anxious and uncertain about my future.” Little did he know that his lifesaver was already in the registry, just waiting to be found. That donor is Harrison Cohn, who accompanied his father to join the registry in June 2014, hoping to help a member of their community, Dr. Oren Warter. Although he wasn’t a match for Warter, a year and a half later he got a call from Gift of Life to say he matched a 67-year-old man who urgently needed a bone marrow transplant to survive. Harrison completed the donation in June 2016, and decided to become a Gift of Life Campus Ambassador at Indiana University to help recruit donors to the registry. At the training symposium for ambassadors in August 2016, Harrison stood up to tell more than 90 other college students about his personal experience donating marrow – and how rewarding it was to know he had helped someone. 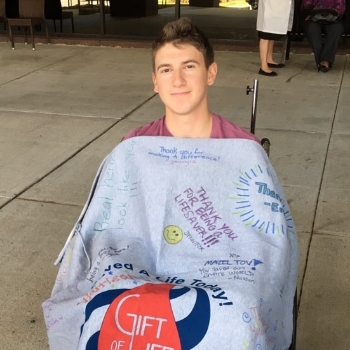 Harrison on his day of donation in 2016 with his Gift of Life blanket, signed by staff members with well wishes and expressions of thanks. Meanwhile, after Sandy’s transplant, and with his wife Blanca’s constant support, he began to recover and to plan ahead for the time when he could return to work. He also wondered who his generous donor was, someone who would give bone marrow to a complete stranger to save their life. In the United States, donors and recipients may not learn each other’s identities until a year after the transplant, and can only communicate through anonymous letters during that time. Then, only a month before the date when Sandy could apply to learn his donor’s identity, Gift of Life called and asked if he would like to be introduced to his donor in Florida at an upcoming event. Even though he had a lifelong career in aviation and had traveled all over the world, this particular trip would be truly special. “It is very emotional and humbling knowing there are wonderful, caring people willing to help a total stranger,” said Sandy. On the stage at the symposium banquet, Sandy was full of anticipation as Gift of Life Chairman Bill Begal told him that his donor felt that he was the lucky one for having been given the opportunity to help someone else. He then asked Harrison to come forward and meet Sandy. As the two men embraced the room filled with applause and cheers. Harrison and Sandy were presented with the Gift of Life Partners for Life award, commemorating the day they met for the first time. Just over a week after meeting Harrison, Sandy returned to work sporting a brand new tattoo featuring the Gift of Life logo with the caption, “Forever grateful to Gift of Life and Harrison Cohn.” His first assignment back on the aviation job he loves so much was in El Salvador. Harrison is a political science major at Indiana University, who also enjoys playing basketball and reading.